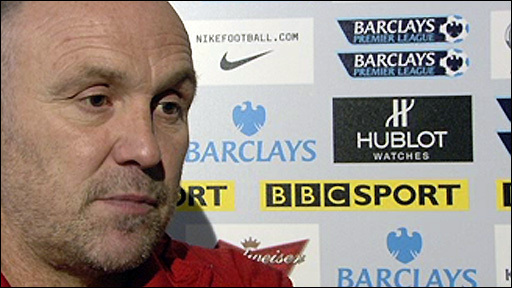 Manchester United salvaged a draw against Sunderland as an unfortunate Anton Ferdinand scored a late own goal. Darren Bent swivelled and rifled in to put Sunderland deservedly ahead, and a below-par United were unable to get a shot in on goal in the first half. Dimitar Berbatov levelled with a superb bicycle kick before Kenwyne Jones nodded Sunderland ahead again. Kieran Richardson was then sent off before Ferdinand diverted in Patrice Evra's shot to hand United a point. 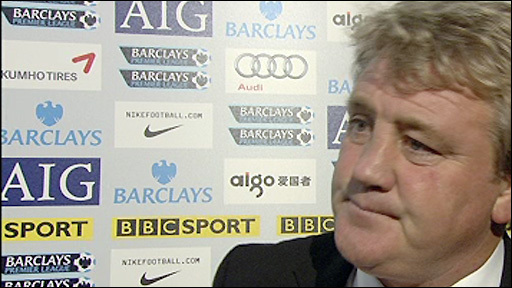 It was a cruel blow for Sunderland, who looked to be heading for their first victory at Old Trafford since 1968. And Richardson will look back ruefully at having been given a needless second yellow card for kicking the ball away, and so leaving his team-mates a man short with the score at 2-1. United must consider themselves fortunate after they were largely out-thought and out-fought. Other than a brief spell shortly after the interval and at the end of the match, Sunderland looked comfortably in control as United struggled. In United's midfield, Darren Fletcher was distinctly off-colour while wide men Nani and Danny Welbeck, making only his second Premier League start, were anonymous. Sunderland's Andy Reid and Lee Cattermole were, in contrast, lively, combative and creative. It was Cattermole's excellent pass that gave Bent a half chance after only seven minutes and the striker turned and shot almost in one movement to beat Ben Foster from just outside the box. The expected United fight back failed to materialise in the opening 45 minutes, with the champions lacking fluency and energy. Sunderland might have made better use of their possession, but an over-eagerness to move forward at rapid pace sometimes prevented them maximising their opportunities. Foster was only tested once by Jones' speculative effort form long range and the visitors might have wondered if they had not taken full advantage of United's poor display. And early in the second half, it seemed that might be the case when Gordon did well to keep out Rooney's effort at the near post only for John O'Shea to return a cross that Berbatov met with an overhead kick, steering the ball into the right corner. It appeared that would be just the spark United needed to shake off their lethargy but it proved to be a temporary awakening. Reid, who in the first half might have conceded a penalty for handball, came forward with purpose and chipped a ball into box. Jones and Foster went up together and as the pair collided, the Sunderland striker nodded the ball into an empty net. United once again looked stunned and although they attempted to force the game, Welbeck shot over and Rooney drove a shot wide. And it took a perfectly timed intervention from Michael Carrick at the other end to prevent Jones tapping in substitute Jordan Henderson's cross and making the game safe. As Sunderland sat deeper, Phil Bardsley and Steed Malbranque cleared well inside their own area and United continued to be frustrated. With time running out, United were offered a glimmer of hope as Richardson foolishly got himself sent off when he kicked the ball away and was cautioned for the second time. That led to a spell of United pressure, and as so often happens, that pressure told when Evra fizzed a shot across goal, Ferdinand deflected the ball in past the helpless Gordon. 90:00+4:34 The referee signals the end of the game. 90:00+3:10 Luis Nani takes the inswinging corner, clearance made by Michael Turner. Inswinging corner taken right-footed by Luis Nani, Anton Ferdinand manages to make a clearance. Inswinging corner taken right-footed by Luis Nani, Lorik Cana manages to make a clearance. 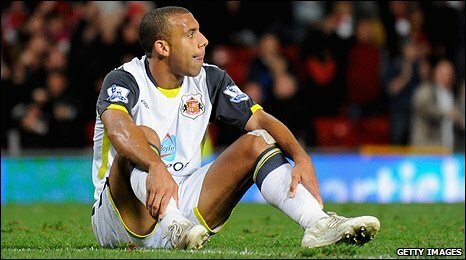 90:00+3:10 GOAL - Anton Ferdinand:Man Utd 2 - 2 Sunderland Anton Ferdinand scores an own goal from 6 yards. Man Utd 2-2 Sunderland. Correction - 90:00+2:20 Luis Nani takes the inswinging corner, clearance by Michael Turner. Corner taken by Luis Nani from the left by-line, clearance made by Anton Ferdinand. Luis Nani takes the inswinging corner, Lorik Cana makes a clearance. Patrice Evra provided the assist for the goal. Correction - 90:00+2:20 GOAL - Anton Ferdinand:Man Utd 2 - 2 Sunderland Own goal by Anton Ferdinand. Man Utd 2-2 Sunderland. Correction - 90:00+2:00 Nemanja Vidic takes a shot. Lorik Cana makes a clearance. Patrice Evra takes a shot. Blocked by Anton Ferdinand. 90:00+2:00 Nemanja Vidic takes a shot. Lorik Cana manages to make a clearance. Patrice Evra takes a shot. Blocked by Anton Ferdinand. 90:00+1:43 The ball is swung over by Luis Nani, clearance made by Anton Ferdinand. 90:00+0:38 Michael Carrick produces a right-footed shot from outside the penalty box and misses left. 88:45 Centre by Antonio Valencia, Anton Ferdinand makes a clearance. 87:28 Wayne Rooney delivers the ball, Close range header by Nemanja Vidic goes over the bar. 86:56 Short corner taken by Wayne Rooney from the right by-line, The ball is crossed by Luis Nani, Lee Cattermole manages to make a clearance. 86:03 Corner taken right-footed by Luis Nani from the left by-line, Jordan Henderson makes a clearance. 84:35 The free kick is delivered right-footed by Luis Nani from right wing, Fraizer Campbell manages to make a clearance. 84:35 Substitution George McCartney joins the action as a substitute, replacing Steed Malbranque. 84:35 Sent off Kieran Richardson receives a red card for second bookable offence. 84:19 Free kick awarded for an unfair challenge on Antonio Valencia by Kieran Richardson. 82:48 Substitution Fraizer Campbell is brought on as a substitute for Kenwyne Jones. 82:48 Effort on goal by Oliveira Anderson from just inside the penalty area goes harmlessly over the target. 82:32 Shot from 35 yards from Luis Nani. Blocked by Steed Malbranque. 76:07 Direct free kick taken by Michael Carrick. 76:07 Booking Anton Ferdinand receives a yellow card for unsporting behaviour. 76:01 Anton Ferdinand concedes a free kick for a foul on Dimitar Berbatov. 75:08 Wayne Rooney takes a shot. Comfortable save by Craig Gordon. 73:01 Substitution Jordan Henderson on for Andy Reid. 72:18 Shot from 20 yards by Wayne Rooney. Anton Ferdinand gets a block in. Corner taken right-footed by Luis Nani, Header from close range by Dimitar Berbatov clears the bar. 70:36 Craig Gordon restarts play with the free kick. 70:36 Substitution Antonio Valencia replaces Danny Welbeck. 70:36 Substitution Darren Fletcher leaves the field to be replaced by Michael Carrick. 70:36 Dimitar Berbatov challenges Craig Gordon unfairly and gives away a free kick. 70:29 Effort from 20 yards by Luis Nani. Save made by Craig Gordon. 70:19 Luis Nani sends in a cross, Michael Turner makes a clearance. 69:35 Inswinging corner taken by Luis Nani from the left by-line, clearance by Anton Ferdinand. 69:18 Corner taken by Wayne Rooney played to the near post, Darren Bent makes a clearance. 69:10 Luis Nani crosses the ball, Michael Turner makes a clearance. 68:41 Outswinging corner taken right-footed by Luis Nani played to the near post, clearance made by Kenwyne Jones. 67:58 Oliveira Anderson fouled by Darren Bent, the ref awards a free kick. Luis Nani crosses the ball from the free kick right-footed from left wing, Kenwyne Jones makes a clearance. 66:42 Dimitar Berbatov delivers the ball. 64:47 Shot from just outside the box by Wayne Rooney misses to the left of the goal. 64:16 Patrice Evra takes the direct free kick. 64:16 Booking Phillip Bardsley receives a caution. 63:59 Phillip Bardsley gives away a free kick for an unfair challenge on Darren Fletcher. 63:22 Free kick awarded for a foul by Nemanja Vidic on Steed Malbranque. Andy Reid crosses the ball from the free kick left-footed from right channel, clearance made by Nemanja Vidic. 62:27 Shot by Danny Welbeck from outside the box goes over the net. 60:26 Danny Welbeck challenges Anton Ferdinand unfairly and gives away a free kick. Direct free kick taken by Craig Gordon. 59:06 Booking Booking for Darren Fletcher for unsporting behaviour. 57:57 The assist for the goal came from Andy Reid. 57:57 GOAL - Kenwyne Jones:Man Utd 1 - 2 Sunderland Kenwyne Jones finds the back of the net with a headed goal from close in. Man Utd 1-2 Sunderland. 56:29 Corner taken right-footed by Luis Nani, Centre by Wayne Rooney, Anton Ferdinand gets a block in. Corner taken by Wayne Rooney played to the near post, clearance by Darren Bent. Save by Craig Gordon. 56:00 Lee Cattermole challenges Luis Nani unfairly and gives away a free kick. Darren Fletcher takes the direct free kick. 55:17 Darren Bent challenges Nemanja Vidic unfairly and gives away a free kick. Direct free kick taken by Jonathan Evans. 54:34 Dimitar Berbatov challenges Lorik Cana unfairly and gives away a free kick. Craig Gordon takes the free kick. 54:25 The ball is swung over by Luis Nani, Michael Turner makes a clearance. 53:25 Foul by Oliveira Anderson on Phillip Bardsley, free kick awarded. Direct free kick taken by Craig Gordon. 50:23 The assist for the goal came from John O'Shea. 50:23 GOAL - Dimitar Berbatov:Man Utd 1 - 1 Sunderland Dimitar Berbatov grabs a goal from inside the penalty box to the bottom right corner of the goal. Man Utd 1-1 Sunderland. 50:13 The ball is crossed by Luis Nani, Wayne Rooney takes a shot. Save by Craig Gordon. 49:29 Steed Malbranque gives away a free kick for an unfair challenge on Jonathan Evans. Free kick taken by Patrice Evra. 47:52 Jonathan Evans gives away a free kick for an unfair challenge on Kenwyne Jones. Free kick taken by Phillip Bardsley. 47:13 Oliveira Anderson delivers the ball. 46:51 Wayne Rooney takes a shot. Anton Ferdinand gets a block in. A cross is delivered by Danny Welbeck, clearance made by Kieran Richardson. 45:51 Unfair challenge on Andy Reid by Nemanja Vidic results in a free kick. Direct free kick taken by Kieran Richardson. 45:15 Foul by Darren Fletcher on Andy Reid, free kick awarded. Kieran Richardson takes the direct free kick. 45:01 Substitution (Man Utd) makes a substitution, with Oliveira Anderson coming on for Paul Scholes. 45:00+2:02 The referee calls an end to the first half. 45:00+1:47 Handball decision goes against Andy Reid. Direct free kick taken by John O'Shea. 43:54 A cross is delivered by Luis Nani, clearance made by Anton Ferdinand. 43:24 The ball is sent over by Darren Fletcher. 39:33 Kieran Richardson concedes a free kick for a foul on Luis Nani. Nemanja Vidic restarts play with the free kick. 38:48 Dimitar Berbatov gives away a free kick for an unfair challenge on Steed Malbranque. Phillip Bardsley restarts play with the free kick. 34:53 Centre by Andy Reid, Nemanja Vidic makes a clearance. 33:26 The referee blows for offside. Ben Foster restarts play with the free kick. 30:45 John O'Shea delivers the ball, clearance made by Phillip Bardsley. 29:56 Free kick awarded for a foul by Phillip Bardsley on Luis Nani. Patrice Evra takes the free kick. 28:40 John O'Shea takes the direct free kick. 28:40 Booking Kieran Richardson receives a yellow card. 28:34 Kieran Richardson gives away a free kick for an unfair challenge on Danny Welbeck. 27:49 Kenwyne Jones takes the chance to get an effort at goal. Save by Ben Foster. 27:08 The ball is crossed by Nemanja Vidic, Craig Gordon makes a save. 26:13 Free kick awarded for an unfair challenge on Patrice Evra by Lee Cattermole. Wayne Rooney takes the free kick. 25:30 The ball is crossed by Steed Malbranque, Jonathan Evans makes a clearance. 24:14 Direct free kick taken by Steed Malbranque. 24:14 Booking Paul Scholes receives a yellow card for unsporting behaviour. 24:10 Foul by Paul Scholes on Darren Bent, free kick awarded. 24:04 The ball is delivered by Patrice Evra, Phillip Bardsley makes a clearance. 22:39 Centre by Patrice Evra, Kenwyne Jones manages to make a clearance. 22:23 Corner taken by Luis Nani, save by Craig Gordon. 22:05 Shot from 18 yards from Paul Scholes. Anton Ferdinand gets a block in. 21:29 The ball is delivered by John O'Shea, clearance by Phillip Bardsley. Corner taken by Luis Nani played to the near post, clearance by Darren Bent. 19:35 Unfair challenge on Danny Welbeck by Phillip Bardsley results in a free kick. Paul Scholes restarts play with the free kick. 17:05 Centre by John O'Shea, Anton Ferdinand makes a clearance. Corner taken right-footed by Luis Nani from the right by-line to the near post, Darren Bent makes a clearance. 16:03 Kieran Richardson concedes a free kick for a foul on Luis Nani. Wayne Rooney shoots direct from the free kick. 12:28 Andy Reid crosses the ball, clearance made by Jonathan Evans. 12:15 The ball is delivered by Luis Nani, clearance made by Anton Ferdinand. 10:35 Shot by Andy Reid from a long way out goes over the net. 8:46 Free kick awarded for a foul by Lee Cattermole on Nemanja Vidic. Ben Foster takes the free kick. 6:33 Assist on the goal came from Lee Cattermole. 6:33 GOAL - Darren Bent:Man Utd 0 - 1 Sunderland Darren Bent finds the back of the net with a fantastic goal from just outside the area to the bottom left corner of the goal. Man Utd 0-1 Sunderland. 5:19 Lee Cattermole is adjudged to have handled the ball. John O'Shea takes the free kick. 4:31 The ball is sent over by Steed Malbranque. 2:44 Unfair challenge on Wayne Rooney by Lorik Cana results in a free kick. Free kick taken by Paul Scholes. 1:31 Kenwyne Jones fouled by John O'Shea, the ref awards a free kick. The free kick is swung in left-footed by Andy Reid, Patrice Evra manages to make a clearance. Corner taken left-footed by Andy Reid from the left by-line, Darren Fletcher makes a clearance. Andy Reid delivers the ball.